The Watershed Conservation Plan provides a framework for prioritizing conservaton and land preservation projects of Raritan Headwaters and our partners in the watershed. 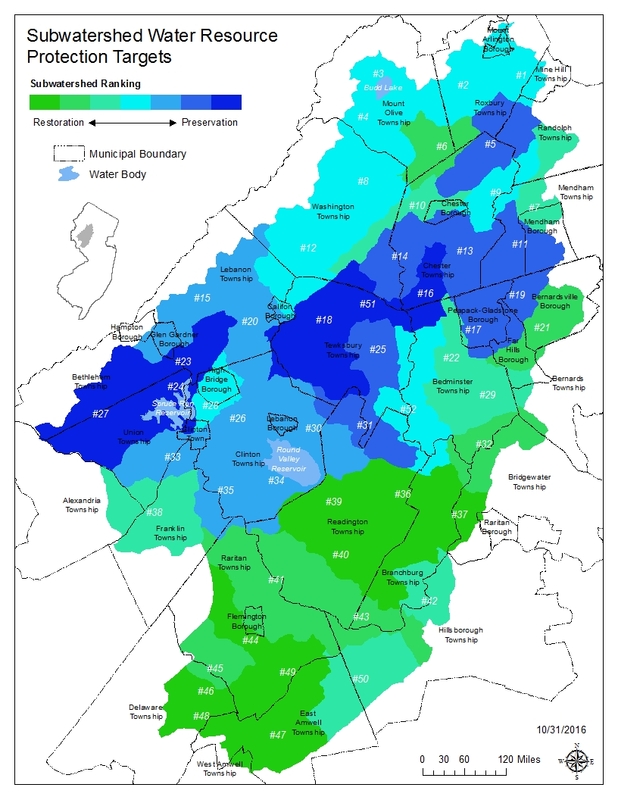 The Upper Raritan Region is made up of 52 subwatersheds. We developed a prioritization spectrum for each subwatershed going from the extreme of high need for restoration (high urban land cover and/or traditional agriculture with poor water quality) on one end and high need of preservation (lots of forest left and good water quality) on the other extreme. Many of the subwatersheds have a mixture of both restoration and preservation needs. Between 1995 and 2012, about 6,000 acres of forests and wetlands were lost in the watershed. Over 12,ooo acres of farmland were lost. They were replaced with residential and commercial development. The result has been an increase in impervious cover such as pavement and buildings, which results in pollution-rich stormwater running off into our streams and rivers instead of infiltrating into our underground aquifers.